Pizza + cake = amazing pizza cake! “Oooooh, I love a bit of cake. Oooooh, cake. Oooooh, cake. Cake. Cake. Cake. Cake. I’m just one of these people. I come home and I need a piece of cake.” – Marjorie Dawes, Little Britain. There’s no secret, I do love a bit of cake. I do love a bit of Little Britain too. Eating cake while watching Little Britain? Now you’re talking. I have been known to be a bit partial to all things sweet when it comes to cake. But now, the greatest invention to arise from my kitchen is the pizza cake, the savoury alternative. But of course it’s not actually called a pizza cake. It’s really a wonderful, easy, upside-down tomato & basil pie from the March 2007 delicious. magazine. A recipe from Belinda Jeffrey’s. Clearly my taste buds have changed over time. Back in 2007 when this recipe was printed, I was not drawn to it nor its author. 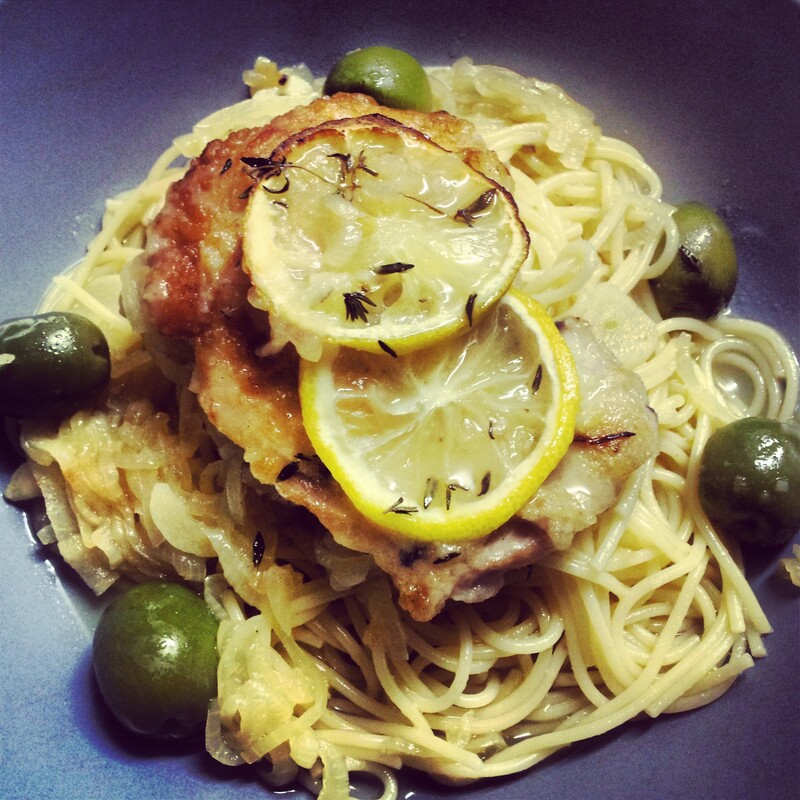 But now, some six years later, I came across this recipe and knew I had to make it! 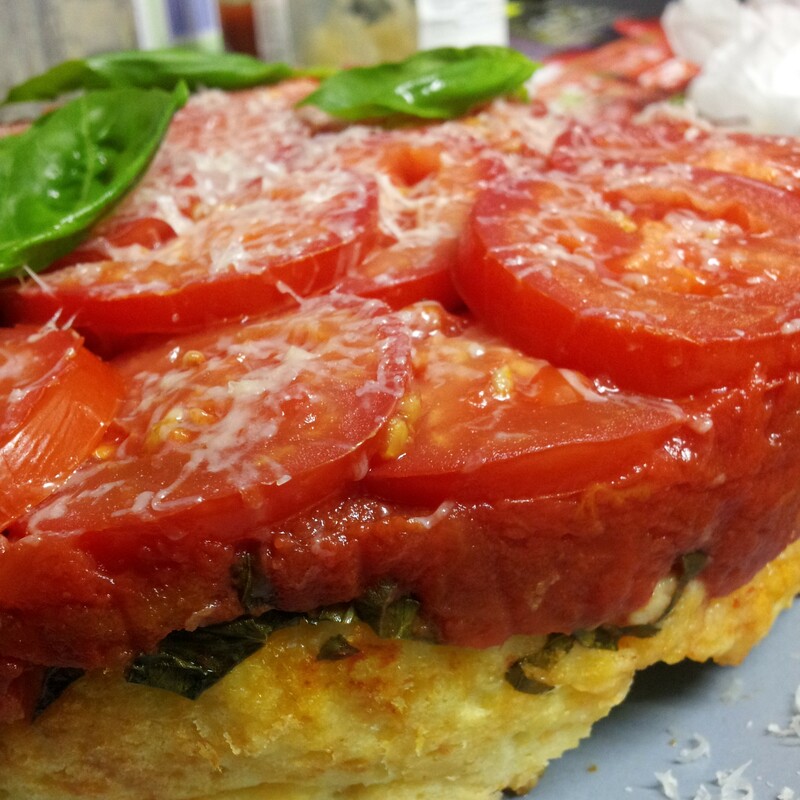 It was something about the simplicity of the ingredients – tomatoes, basil, cheese. I instantly knew it would be a winner. But what I didn’t realise was how awesome it really was or the endless potential for this cake. Let’s begin. This cake, in all its rustic beauty, is only as good as the ingredients you use. My suggestion is buy your tomatoes a couple of days before you are ready to use them and leave them on the bench to ripen further. Smell them. If they smell like tomato, use them. I also like to use organic tinned tomatoes. Don’t judge me. I think they are affordable and that you will taste the difference. As for the basil, grow your own. Or not. Basil. Yum. I can almost smell it while I am typing this. Of course, in the pursuit of shortcuts in the kitchen, I broke all the rules, and chose to ignore Belinda’s carefully written instructions by placing all the “cake” ingredients into the food processor at once. No harm done. Amazing pizza cake! Once you have carefully sliced your roma tomatoes and made a pretty pattern on the base of the pan you have chosen to use, carefully spoon the tinned tomatoes over the top. Next time I think I will actually mix the basil through the tinned tomatoes rather than sprinkling it on top. I think it will only improve the flavour. When choosing your pan, don’t do what I did and use a springform pan. Big mistake. All the juicy goodness from the tomatoes kind of oozed out of the bottom of the pan and out into my oven. What a waste. Use a pie dish or something similar, but don’t forget to grease it and line the base with baking paper. Even if it is non-stick. Spread the cake mixture over the tomatoes and bake in the oven as suggested. Check it after the cooking time is up to make sure it is completely cooked through. Bring it out of the oven, flip it onto your serving plate. Slice it up and devour! Amazing pizza cake! Let it be said that you will see this cake again this month. When you make this cake it will be the most amazing, mind-blowing, wonderful, easy, amazing pizza cake you have ever tasted! And I owe it all to Belinda Jeffrey’s. Thank you! Preheat your oven to 180 degrees celcius. Butter a shallow 26cm round ovenproof dish and line the base with buttered baking paper. Set it aside. Pour canned tomatoes into a sieve over a bowl. Leave to drain for 5-10 minutes. Give it a stir occasionally to make sure as much liquid seeps away as possible. Meanwhile, whiz flour, mustard and 1 teaspoon of salt in a food processor. Add cheeses and whiz to just combine. Scatter butter over the top and process until the mixture resembles coarse breadcrumbs. (if you don’t have a food processor, you can do this in a bowl and rub the butter in by hand.) Tip mixture into a bowl. In another bowl, whisk the eggs, milk and Tabasco. Make a well in the cheese mixture and pour in the egg mixture then stir to make a fairly stiff batter. Test it by inserting a fine skewere into the pie, if it comes out clean the pie is ready. Remove teh pie from the oven and leave it to settle in the dish for 5 minutes before inverting it onto a warm serving platter. Mop up any juices that seep out onto the platter and scatter over basil leaves.